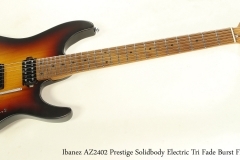 The Ibanez AZ2402 Prestige, part of the new AZ line, again demonstrates the progression of Ibanez towards top quality instruments. 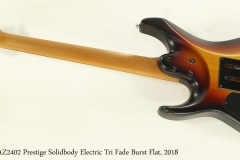 This professional-grade guitar features a very nicely contoured Alder body, Roasted Maple neck, Stainless Steel frets, with Gotoh and Seymour Duncan hardware. We have been fans of Ibanez guitars for many years, and are very pleased to carry these new models. Seen here in the Tri-Fade Burst Flat finish, the Ibanez AZ2402 Prestige is also available in Ice Blue Metallic. The original molded hard-shell case is included. “Even though Ibanez is thought of as a modern guitar brand, we have decades of accumulated knowledge and a history of pushing the boundaries. The AZ series carries with it all of the hallmarks of these tried and tested Ibanez qualities: the smooth oval neck grip, the well balanced asymmetrical body shape, and the neck heel allowing unrivaled playability. S-TECH special roasted treatment increases the wood’s stability, durability, water resistance and tolerance of temperature changes. The neck is sealed with an oil finish which helps make it feel similar to a well-played guitar neck. S-TECH special roasted treatment provides a superior attack and a well-balanced tone and a rich sustain. In order to achieve supreme neck grip comfort, the fretboard edge is finished with a smooth curve. The Super All Access Neck Joint offers superior playability with its 8mm concave curve from the body top to the spherical surface of the joint area. By maximizing the joint area between the body and the neck, sustain and resonance are increased as well. The AZ comes with GOTOH® MAGNUM LOCK® machine heads, which have an established reputation for tuning stability. Its H. A. P® (Height Adjustable Post). system allows for the adjustment of string posts for the appropriate tension of each string. The Oil-impregnated bone nut provides superior tuning stability and warm rich resonance. Stainless steel frets boast excellent corrosion resistance. The wide and tall fret-type offers a quick response, good articulation when playing chords and clear tone when playing single notes. Seymour Duncan® Hyperion™ Pickups feature a moderate output through Alnico-5 magnets to keep the clarity of the fundamental tone when using a distortion sound, and to deliver a clear pick attack. From treble to bass, the overall tonal balance is evenly adjusted., and works well with various effect pedals.